Yesterday marked the beginning of a new year. The Church Year begins anew with the first Sunday in Advent, Ad Te Levavi. Why is the Church's calendar so different from the world's? They’re telling different stories. The world is telling a story of life that ends in death; the Church is telling the story of her Lord, a story of death that ends in life. So the calendar of the Church is arranged to tell the story of Jesus Christ. There are two halves to the year, the Semester of the Lord and the Semester of the Church. In the first half, the Semester of the Lord, she focuses on a semi-chronological account of the life, death, and resurrection of Jesus. (She readily admits, however, that chronology is not her forte, beginning the year with Jesus' entry into Jerusalem.) The year begins with Advent, the season of anticipation for the “coming” of Jesus. This season anticipates both His coming at Christmas and also His coming once-and-for-all at His return. Advent has both a preparatory as well as a penitential mood to it. Then follows Christmas, always on December 25th. The Season of Christmas continues until the season of Epiphany. Epiphany is actually an older celebration than Christmas (second only to Easter) that celebrates the manifestation of Jesus as both God and man. Epiphany is also when we celebrate the Magi (who represent all nations) coming to visit Jesus. Throughout these seasons, we celebrate significant events in the life of Jesus. 8 days after His birth, He was circumcised and given His Name (merely by accident this coincides with the world's New Year). During Epiphany, we celebrate our Lord’s Baptism as well as His first miracle. Epiphany ends with the Festival of the Transfiguration, the manifestation of Jesus’ glory to His disciples. The three weeks before Lent are a mini-season (Gesima-tide) designed to prepare us for Lent. Lent, a season of fasting and repentance, focuses our attention on the coming Passion of Jesus. The last two weeks of Lent are Passiontide, when the fasting increases and the mood becomes even more somber. Passiontide and Lent culminate in Holy Week, the week when the Church tells the story of the last week of the life of her Lord Jesus. Lent—with its fasting and weeping—ends on Easter (technically on Easter Eve, the Easter Vigil), the season when the Church proclaims the Resurrection of Her Lord and the promise of eternal life for all who have faith in Him for forgiveness. A season full of unbridled joy, Easter lasts 7 weeks. Fourty days after His Resurrection, Jesus ascended; so, forty days after Easter, at the Ascension of the Lord, the Church celebrates the fact that human flesh now dwells at the right hand of God the Father, in the God-man Jesus. Fifty days after Easter is Pentecost, an Old Testament harvest festival that now celebrates the “harvest” of believers for Christ. Marking the outpouring of the Holy Spirit onto the disciples, Pentecost is also the birthday of the Church. Pentecost marks the transition from the Semester of the Lord to the Semester of the Church, which begins with Trinity Sunday. This second half of the Church Year focuses on How the Lord grows His Church through His gifts of Word and Sacrament. Trinity season culminates with a 3-week season at the end (akin to the 3-week season that prepares us for Lent) that prepares us for Advent and the start of another Church Year. Then the cycle begins all over again, as the Church never ceases to proclaim the story of her Lord, the story of salvation. Go here. Read it. Sign it. I did. I keep hearing about an agreement between Lutherans and Catholics. What’s that? This year marks the tenth anniversary of the Joint Declaration on the Doctrine of Justification, a statement signed by Roman Catholic and Lutheran theologians, declaring their agreement on the doctrine of Justification. That’s right, the doctrine of Justification, the article that caused the reformation, the article—Lutherans assert—on which the Church stands or falls. Confessional Lutheran groups, or those who hold to the authority of the Scriptures and who believe the Lutheran Confessions a faithful exposition of Scripture, including the Missouri Synod, did not sign on. (In fact, the Missouri Synod wasn’t even invited to the last round of discussion, the one that led to the JDDJ, but that’s another story.) Seven years later, in 2006, the World Methodist Council voted to adopt the JDDJ as well. So, there you have it. Apparently Roman Catholics, Lutherans, and Methodists all agree on the doctrine of Justification. So what’s the big deal? Why are Lutherans and Roman Catholics still divided? As the JDDJ reveals, even if they use the same words, Lutherans and Roman Catholics don’t mean them the same way. In other words, they are not agreed. Not even close. What keeps Lutherans from being Roman Catholic? The word “catholic” is bigger than the Roman Catholic church. Catholic comes from two Greek words, meaning “according to the whole,” or universal. In fact, the term “Roman Catholic” is by nature contradictory; you can’t be both universal and confined to a location (like Rome). In the Nicene Creed, we confess that we believe in one, holy, catholic, and apostolic church. That’s the Church of the apostles, the Church throughout history, the universal Church. When arguing against the false teachings of the Roman Catholic church, the reformers sought to make their case that they were not creating any new church. Rather, they were continuing in the one, holy, catholic, and apostolic church that had existed for 1,500 years. As they saw it, they were merely calling the Roman church to repent of newly minted false teachings and practices and return to the true, catholic church, the church with the doctrine of the apostles. It’s all a matter of perspective. From the perspective of the Lutherans, it is not they who “broke off” from the Church of Rome, but rather the Church of Rome that had departed from the true, catholic church. At least three major things keep Rome and Wittenberg apart: Justification by works, the anti-Christ nature of the papacy, and the abomination of the Roman Mass. For all the ecumenism and cooperation that went into the meetings leading up to the Joint Declaration, the result is not an agreement on Justification. The Church of Rome still teaches justification by works, even if she can agree to justification by grace. Therein lies a difference of terms. When Rome says “by grace,” what she means is, “God gives you grace through His sacraments which enable you to do the God-pleasing works that merit His mercy.” That’s still justification by works, and it’s an abomination. Anything which makes a person look to himself for confidence for salvation must be completely rejected, whether works to earn God’s mercy or a decision to accept His grace. While Pope Benedict XVI is known for his appreciation of Luther and Lutheran scholarship, the official teachings of the Church of Rome on the office of the papacy are still problematic for Lutherans. Because Rome teaches that the Bishop of Rome is the head of the church by divine right, not by human arrangement, because he claims for himself authority over Scripture, and because the Church of Rome teaches that popes and councils cannot err, the Lutheran Confessions rightly call the office of the papacy anti-Christ. Third, while the Lutheran Divine Service and the Roman Catholic Mass look very similar (and, in fact, the first Lutherans argued that they observed the Mass with greater reverence than their opponents), they is one big dissimilarity. In the Roman Mass, the Lord’s Supper is a work that further earns God’s mercy. So the priest can “say Mass” without anyone around to hear or receive the Body and Blood of Jesus because what matters is that the work of the Mass is done to appease God. In the Lutheran Mass, the Lord’s Supper is the way God delivers His gifts of forgiveness, life, and salvation. The Divine Service is not our offering something to God; it’s God’s coming to us. That’s why Luther called the Roman Mass an abomination; it has the direction of the gifts backwards. Writing at Crosswalk, Jim Tonkowich uses recent events at Calvin College to highlight a fundamental misapplication of Luther and the Reformation. You are not free to interpret Scripture as you see fit. Sermons preached at Hope are available from our website: HopeLCMS.com. I also usually email out each Sunday's sermon to people who've asked to receive that. If you want to be included in that group, email me at pastor [at] hopelcms [dot] com and I'll add you. ATP: How to listen to a sermon? How should I listen to a sermon? I tell catechumens to answer three questions about each sermon. What is the Law? What is the Gospel? What does this mean for me? As you listen to any sermon, try to answer those questions. The Law is what accuses you of sin. Not your neighbor, not the world, not the guy in the pew in front of you. You. The Law isn’t concerned with anyone else’s sin, just yours. And, properly preached, the Law doesn’t give you any hope. It doesn’t give you steps to follow to make your life better. It accuses you. It is, as Jesus said it would be, a call to repentance. The Gospel is what delivers the forgiveness of sins. As the Law shows you your sin, the Gospel shows you your Savior. Christ crucified is the pure Gospel. But the Gospel doesn’t end at Calvary. How does that forgiveness Jesus won on the cross get delivered to you? Forgiveness is delivered through means: Holy Baptism, Absolution, the Lord’s Supper. These sacraments are Gospel, too. In fact, Lutheran preaching is sacramental. It doesn’t just tell you about forgiveness; it delivers that forgiveness. And it calls you to receive that forgiveness. Every sermon is like an altar call to the Lord’s Supper where you receive the forgiveness of sins. If a sermon is lite on Law, the Gospel is unnecessary. If you’re not a big sinner, you don’t need big forgiveness. If the sermon is lite on Gospel, the Law will either produce despair or self-righteousness. If there’s no hope of forgiveness, you’ve got to fulfill the Law yourself. Law and Gospel go hand-in-hand. The Law is to cause you to see only sin when you look at yourself. The Gospel calls you to quit looking at yourself and look instead at Jesus Christ crucified to forgive your sins. So, try it out. Some sermons will be easier than others (probably the preacher’s fault, not yours), but every sermon should be repentance and forgiveness of sins in Jesus’ name. Lots of pastors do some form of an "Ask the Pastor" forum, many even on their blogs. I've been doing one in the bulletin at Hope for a little while and thought it might work well here, too. Usually there's one of these per week, but I'll post the old ones, too, until they're all up. Feel free to email me any questions or post them in the comments to any ATP post. Click on my profile link to the right to get my email address. Jesus didn't come to make you prosperous, at least not in the same way your financial planner wants to make you prosperous. The prosperity gospel is no Gospel. And yet, it sells just as well in affluent white suburbs as in impoverished Ghanan villages. At the installation of Pr. Joel Fritsche at my vicarage congregation, I shared with him this word from St. Paul to St. Timothy: "I endure everything for the sake of the elect, that they may obtain the salvation that is in Christ Jesus with eternal glory." Sometimes this business of being the Lord's absolution guy is difficult. But the elect are worth it. Those not among the elect, who, through the hardening of their hearts and the sealing of their ears, have closed themselves off to the Word of God, will not welcome God's absolution guy. His word that calls them to repentance will be unwelcome, and so his word that forgives their sins will go unspoken. They will plot and scheme against him; they will attempt to thwart the Word of God; they will be a thorn not only in his side but also in the sides of the elect. But the elect are worth it. What marvelous comfort there is in St. Paul's exhortation: the Lord's elect are worth it. By the power of the Holy Spirit delivered to those who occupy this Office of Christ, I endure everything for the sake of the elect. Some days I hate this. Pastoral job satisfaction = x; sins forgiven = y; sins retained = z.
x is directly related to y, but inversely related to z. And if z ≥ 1, x = 0. Pastors don’t get the kind of job satisfaction that those in other careers do. Lawyers either win the case or lose it. Doctors either cure patients or don’t. For plumbers, either the fitting is watertight or leaks. Either the wall is plumb or crooked. Either the investment appreciates of depreciates. So it goes. For pastors, well, people either go to heaven or hell. But no one sees that. There’s no measurable result. Worse, when the elect go to heaven, it’s because the Lord saves His elect. When the damned go to hell, it’s because of the hardness of their hearts and their refusal to hear and receive the Word of God. So what’s a pastor to do? Love his people. Pray for them. Deliver the Word of God to them. Call them to the altar. Be satisfied with faithfulness and entrust success to the Lord. So why are some days still so taxing? Do Christians still sin? Yes. But do they hate their sin? Yes. And they want to be rid of it. The person who loves his sin, who persists in it, cannot be considered a Christian. We also hear about this wicked servant that, after he had experienced grace at the hand of the king, he became proud and obstinate, stirring up the king's wrath once more. That's the way the godless world is which horribly misuses this doctrine of the forgiveness of sins. Some refuse to admit their sins; even though they are wallowing in sin over their heads, yet they refuse to admit that they are sinners. For such people there is not forgiveness; for as we said earlier, If there is no sin, neither can there be any forgiveness. Some keep right on sinning after receiving forgiveness, believing that the gospel allows everyone to do just as he pleases. But the gospel is a message for the depressed, for the people with a guilty conscience, not for those who keep on defensing their sins, nor is it for those who deliberately sin against a gracious God. Poison in the Lord's Cup? Fear of germs has long fueled the argument for individual cups at the Lord's Supper, either glass shot glasses or plastic Dixie cups. 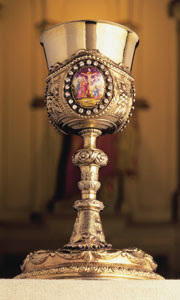 Is there really a risk of infection from drinking the Blood of Jesus from the same cup used by brothers and sisters in the Body of Christ? Pr. Petersen cites this LA Times article which reveals studies done by microbiologists that conclude there is no increased transmission of germs among people who drink their Lord's Blood from the chalice versus those who don't. Really, no poison in His cup? That can't be right... Or can it?